"Time is precious, waste it wisely." It has been said that time is eternal, that time can heal all wounds and that it has no beginning and no end. Time gives us a meaning to the past, present and future. Time moves; yesterday was not the same as today and today will not be tomorrow. Every creation is built with time, from a flower blooming, to growing up, to the creation of the universe itself. Time is always there. It can be quite difficult to wrap our minds around the concept of time but it is all around us and flies by in an instant. Depending on our mindset, time can drag on and on, and at other times, it's gone in a flash. It's all how you perceive it. I have always found the concept of time to be incredibly interesting and powerful. Along with that comes the fascination of clocks and watches. They are timeless (pun unintended), classic, beautiful and intricate pieces of art that help us function day in and day out. When I was contacted by Jord Watches (pronounced "yord" and translates to earth, soil and land in Swedish) I was so intrigued. Not only are their watches gorgeous but the fact that they are hand-crafted in the US out of WOOD was amazing to me and totally unique. They are definitely a statement piece that are bound to attract loads of compliments. I love the fact that they are hand-made with love and care from sustainable natural wood. Nature is beauty in my eyes and each watch is completely different from each other in the sense that not one piece of wood are the same. They have varying textures, colors and grain which makes each Jord watch unique. They combine modern design and natural elements to create something that is truly one of a kind. Some or all products shown in this post may have been provided by the said brand(s) and/or website(s) for potential review and/or use. For more information, please read my DISCLAIMER. Jord offers a variety of women's and men's watches made from bamboo, maple, sandalwood, blackwood, cherry, zebrawood, koa, purple heart, ebony and rosewood. After much debate, I picked the Cora Series Women's Watch in Koa and Rose Gold. I loved the warm tones of the Koa wood and I am a sucker for rose gold. I also felt that the colors of this watch worked well as a neutral so it can go well with most outfits. Cora is Jord's first automatic women's time piece. It is adorned with swarovski crystal markers that lie on a lovely rose gold face. The round aperture allows you to peek in and marvel at the intricate beauty and complication of the automatic movement. 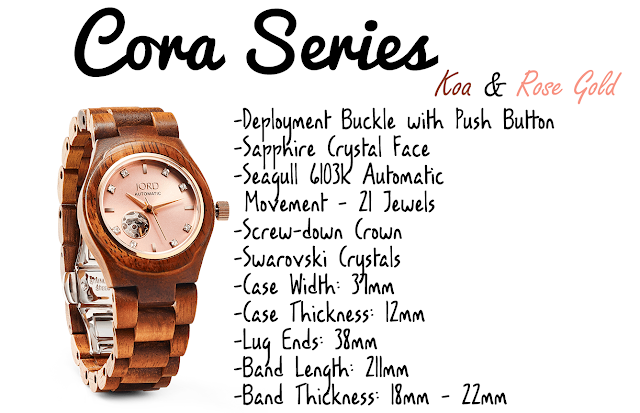 Cora's sophistication and elegance is balanced with the natural beauty and complexity of koa wood. They create a juxtaposition that work so well together and is one of the things I love the most about this watch. Also, please keep in mind that Jord watches are considered to be splash proof but due to the nature of natural wood, it is not recommended to completely submerge your time piece in water since it can damage and morph the wood. The watch came neatly packaged in a matching wooden box which is great because you can use the box to store the watch itself, or to store other knick knacks and trinkets. The watch is presented wrapped around a cute little pillow and it comes with instructions, a cloth to wipe your watch and a limited warranty card. Upon ordering your watch, you measure your wrist using the provided ruler template on their website so you get the perfect fit. You are also provided with extra link(s) just in case your watch doesn't fit exactly how you want it. Wearing this watch is extremely comfortable and light weight compared to traditional watches like metal/leather. The wood isn't treated with anything which is great and the back of the watch is made of stainless steel. One of my favorite features about the Cora watch is the fact that you can see what's going on inside which I find SO fascinating. Seeing all the mechanisms work in their complex ways is so cool in my opinion. Also, this watch is an automatic watch which means that it runs on no batteries, just your natural movement and energy! It also features a deployment buckle with a push button which makes it easy to put on your wrist with a single hand and easy to remove. I am so in love with this watch and I wear it as often as I can. I have gotten so many compliments already. It's definitely becoming one of my favorite pieces in my wardrobe. If you are in the market for a new watch, then definitely check out Jord watches. As you can see, they are absolutely gorgeous and uniquely beautiful. There's a style for everyone and their watches start at $120 USD and they ship worldwide. Take care! Oh my goodness, I for one love the scent of wood, especially in fragrance. I must share this post with my husband. We love the timeless look of wood, and on a watch?? how fitting and fabulous. :) Great review thank you for sharing this special item. Thank you for taking the time to comment! Each one is read and appreciated! 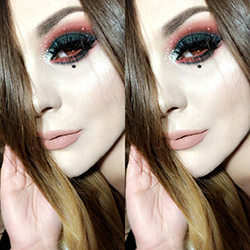 My name is Veronica and I am a Los Angeles based music loving makeup blogger with too many feelings, a free spirit and a knack for the whimsical, dark and twisted things in life. Here you will find an assortment of makeup looks from avant-garde to natural as well as product reviews and my personal tips and tricks. Enjoy!